​336 million daily active users isn’t a number we can shrug off. 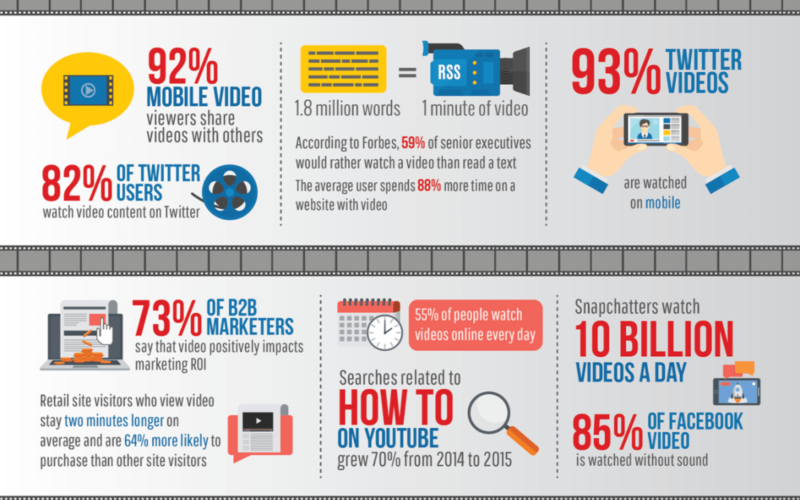 On the contrary, it’s one of the reasons why we think video marketing on a social media platform like Twitter can give your business a lot of desired results. Yes, marketing on Twitter at a surface level might mean you're missing out on opportunities to communicate with many worldwide users. It's true that content on Twitter doesn't have a very long lifespan because of its constantly updating feed, but that only means your video marketing strategies have a huge potential in terms of effectivity. The number of links, texts, and the most random of retweets dominant on a lot of people's feeds, tweets with videos is a refreshing sight to a lot of users' eyes. In fact, tweets that include videos are six times more likely to be retweeted than typical tweets that include images. So, technically speaking, video marketing on Twitter helps brands -- who market on Twitter -- stand out above the noise of the twittering crowd. But as with all things on the internet, much has changed over the years. And nowadays, users -- and brands -- are no longer limited to text-only Tweets. There are pictures, GIFs, and of course, videos. Honestly, who wouldn't be fond of videos? Over 82% of Twitter users actively watch it on the platform. While not very popular in comparison to other giant social networking platforms, social media marketers are well aware of Twitter being a highly personal and engaging platform when you invest some time and actually interact. Early in 2015, Twitter launched promoted video ads, and later, followed it with in-stream video ads in April of 2017. They are constantly updating, and improving on their video functionality, and even announced a few days ago that live broadcasts will soon have a place within their app. Between Facebook and Twitter, it's true that video marketing on the platform will have fewer video ad views. But because of its smaller popularity, the views you gather on Twitter are more meaningful. They're of higher quality, and more likely to convert. And according to a Nielsen study commissioned by Twitter itself, revealed that 41% of people on Twitter bought products after being exposed to an ad. Tell a story; one with a clear beginning, middle, and end (Venture Beat). Videos that are geared toward simple entertainment can generate a 15% higher intent to share (@katieaka on Twitter Blog). Producing and sharing video content on Twitter can be done in 3 ways. You can either do it the native way, or through Periscope. Videos automatically play on users' timelines. That means as your audience scrolls through their feed, they will see your videos play out. You can try shooting videos through the mobile app itself, or upload one from your phone's storage. Live videos are powered by Periscope -- the feature on Twitter that lets you broadcast live videos from within the Twitter app on both Android and iOS. This function lets you capture events as they happen, and it's very ideal for vloggers. And of course, it's very much useful for your own video marketing campaigns in the future. You can record from the front and the rear camera. And just before you go live, it's recommended you add a caption in the "What's happening?" field, so your users know what this video stream is all about. (Be as creative as you can be). Users can interact and comment freely as your livestream goes on. 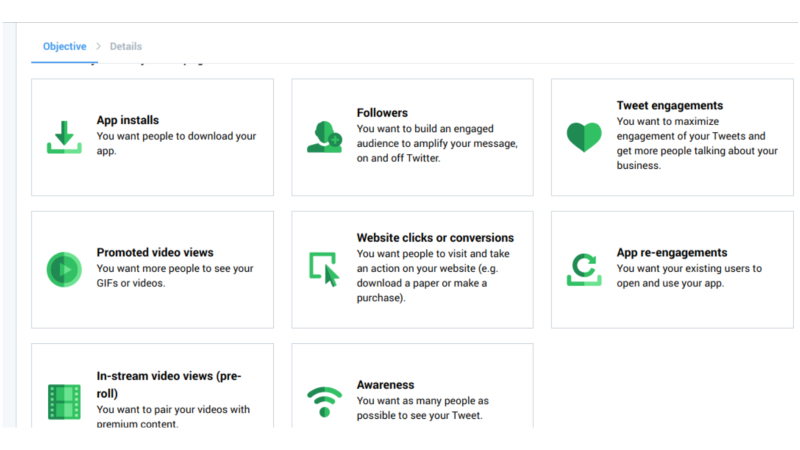 Upon launching the Twitter Ads Manager, you can see different types of ads you can use for promoting what you need on Twitter. It asks you to choose an objective from its given set of campaign goals. Each of them leads to a different type of ad production. For video marketing purposes, the two campaigns you can choose from are: Promoted Video Views or In-stream Video Views (pre-roll). Supposing you already made a very profitable video for your brand, with high-quality everything. But what if it's not getting the attention that it should? Promoted Video Views as a campaign objective can help you with this. It's the perfect method to use to maximize your video's views as it automatically plays within your audiences' timelines. Furthermore, it encourages interactions with every tap and click. Profiles & tweet detail pages: When a user you've targeted visits a Twitter profile, they may be served with your video. Users' timelines: Your videos have a higher likelihood of showing up within a user's timeline if an advertiser has promoted a Tweet that is relevant to that user. In-stream ads a pre-roll ads playing before the video content from one of Twitter's selected content partners (Twitter has over 200). This maximizes your video's views. Twitter does this by borrowing equity from their big-brand partners. This way, you can build brand relevance and align with your audiences' interests by running targeted pre-roll ads before videos your customers are watching. In-stream videos are automatically matched with publisher content when your campaign goes live. The video will play within the tweet of the partner Twitter matched your video to, and will have an "ad by (your Twitter handle)" message while it's playing. And much like YouTube, if it exceeds 6 seconds, a 'Skip' button will appear for the user's convenience. Aside from freely marketing your brand on Twitter, in-stream video ads allow you to extend the reach of your video ad campaigns. And ultimately, it helps you connect with what your audience is talking about. To create highly successful video ads on Twitter, general practices known to bring positive results must be kept in mind. Keeping something visual doesn't automatically pertain to audio-visuals. Don't presume that viewers automatically watch your ad with sound. Because of the pace of people's lives, and how we consume content nowadays, it's more likely that your audience will be viewing your ads without sound. So make sure your message is clear even in the absence of audio. Use bright and attractive visuals as well as relatable characters. Don't forget to emphasize your brand image either. And furthermore, keep your messaging concise. Make it clear in a minute or less. If your message isn't immediately understandable, maybe it's time to rethink your messaging. You have to capture your audience's attention in 8 seconds or less and convince them to stay and watch at the same time. Highlight your product value: Focus on how your product or service will improve a customer's life or solve their problems. Studies show that it lifts familiarity by 5% and brand affinity by 14%. Structure your story: People are attracted to stories. For this reason, no matter how short it is, have the story intact. Videos with a clear story arc can grow purchase intent up to 9%. Be entertaining: Nobody likes a thirty-second video that's a total bore. Always aim for entertaining your target audience for a 15% higher intent to share. Unless it's a character that is a staple in pop culture, few people will watch something they can hardly relate to. Seeing another person's face in the ad makes it more relatable. A heavy impact is reliant on your audience finding the visual ad entertaining and relatable enough to share and engage with. Research has shown that a significant number of people -- on and off the internet -- trust their peers' reviews more than any sales-y claim made by a product or service. It doesn't take a rocket scientist to figure out why companies are taking customer reviews seriously, and asking for feedback from clients. Reviews matter. This also means you would do well to make use of social proof in your visual ads. Show your target audiences just how many people love your products or services; how highly-recommended it is; or the amount of positive and adoring reviews you've gotten. On a technical side, emphasize the inner and outer workings of your products by using close-up shots during filming. The reason for this is because many people browse the internet using their smartphones. So don't make the mistake of forcing your audiences to squint! Emphasize the assets of your product. Highlight the details with beautiful and catchy close-ups. Reusing and tweaking old blog posts so they masquerade as fresh and new ones are bad! The importance of content distribution is significant. A good video is useless if nobody is watching it. Furthermore, investing in paid video ads on Twitter also ups the chance of your target audience noticing your services, but maximizing your content distribution won’t hurt your business either. Hashtags have long been universally recognized as an important tool for allowing users to organize and sort tweets. Hashtags are for indicating that a specific content is relevant to a certain topic. And furthermore, it aids in making your tweets visible in front of an interested audience. Just remember to use the right and relevant hashtags in your Twitter video ads to generate the right traffic and encourage engagement. Don't settle for a mediocre or a plainly boring video going through the same formula of a highly generic ad. Don't hesitate to deviate from the status quo. Just don't stray too far to the point that you've actually ruined the entire idea of you having a Twitter video ad in the first place. Make us of humorous gifs, 30-second how-to videos, short product demonstration videos, and more. Test out different strategies and videos and see what works! Are Twitter Video ads even worth it? To be frank and completely honest, Twitter isn't exactly known for being the biggest social media platform on the internet. In fact, it's dwarfed in its video capabilities when you place them in comparison to Instagram, YouTube, or Facebook. Twitter posts don't stick around long for massive recall either, and although it provides useful analytics, Google can still do them one better. 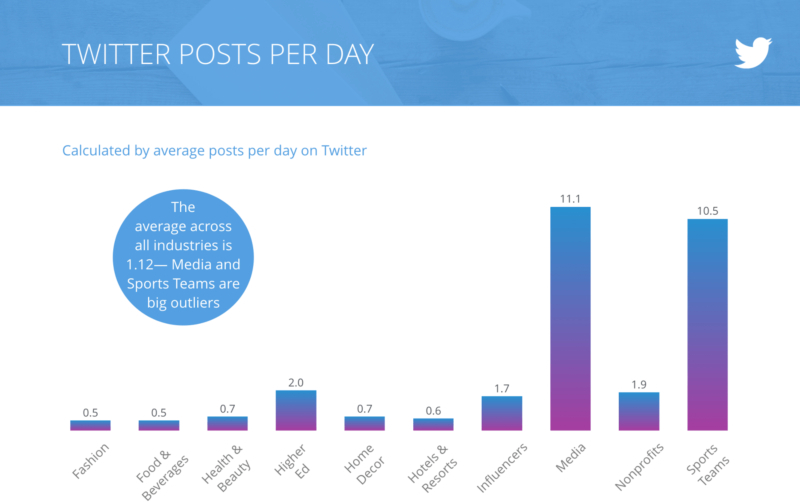 However, what Twitter has is one of the most ad-engaged audiences of any platform. In situations like this, remember that if a person sees an ad at least seven times, the chances of them availing of your services or buying your products increases exponentially. Your target audience doesn't have to necessarily convert on Twitter, but the ad placements you have in place can certainly help keep your brand on top and offer better chances of converting a prospect customer in the long run.